Labrador Retrievers are an extremely popular choice of dog; they are both gentle and affectionate. If they do not exercise regularly they can gain weight easily, in turn putting stress on their joints Eukanuba have therefore created Labrador Retriever Chicken, a complete and balanced daily food designed to keep the joints healthy, as well as help to control weight gain. Recommended For: Adult Labrador Retriever (1+ years). Dried Chicken And Turkey (23%, A Natural Source Of Taurine), Maize, Wheat, Sorghum, Barley, Animal Fat, Dried Beet Pulp (2.8%), Hydrolysed Animal Proteins, Dried Whole Egg, Potassium Chloride, Fish Oil, Calcium Carbonate, Sodium Chloride, Sodium Hexametaphosphate, Fructooligosaccharides (0.28%), Linseed, Glucosamine (432mg/Kg), Chondroitin Sulphate (43mg/Kg). Vitamin A (45551 IU/Kg), Vitamin D3 (1512 IU/Kg), Vitamin E (253 Mg/Kg), L-Carnitine (48.1 Mg/Kg), Beta-Carotene (5.0 Mg/Kg). Contain Basic Cobaltous Carbonate Monohydrate (0.59 Mg/Kg), Cupric Sulphate Pentahydrate (56 Mg/Kg),Potassium Iodide (4.0 Mg/Kg), Ferrous Sulphate Monohydrate (741 Mg/Kg), Manganous Sulphate Monohydrate (56 Mg/Kg), Manganous Oxide (40 Mg/Kg), Zinc Oxide (257 Mg/Kg). 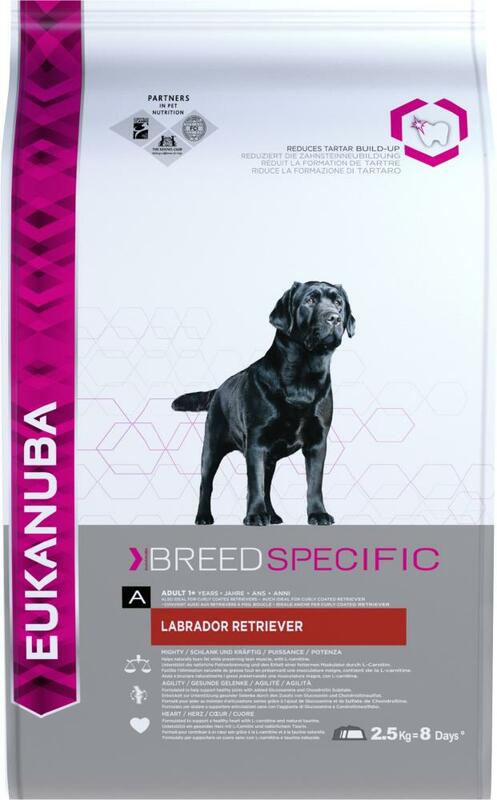 There are currently no questions for Eukanuba Adult Labrador Retriever Chicken Dog Food - be the first to ask one!